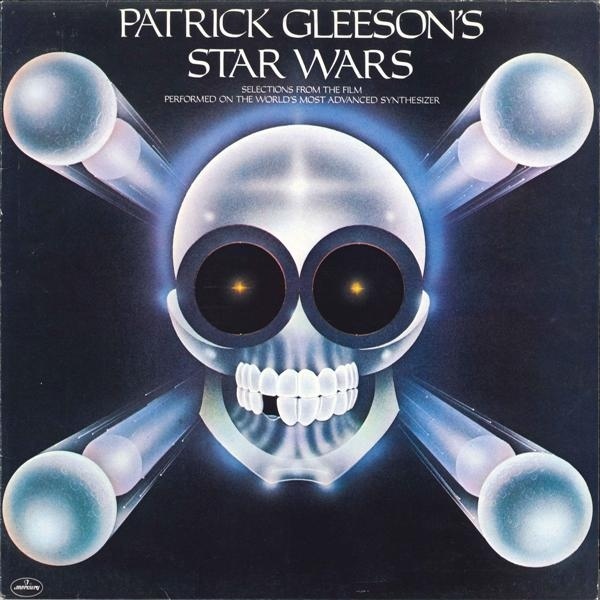 Hopefully you've had a chance to check out the best Star Wars album cover art before you go any further. And let me be perfectly clear that the judgement of these album covers does not reflect the quality of the music produced. All of these music artists are very talented and most of these albums are actually worth listening to if you are a Star Wars fan. But let's face it...album covers are very unpredictable. I'm sure you can remember times when you went to the record store and found that new album and went "this is it?" Several of these covers had me scratching my head. You have an awesome opportunity to bank on a popular movie franchise, but you either don't hire a good artist or you decide to go abstract. Now, I understand that maybe some of these albums were probably trying to stay away from licensing fees, but back in the day, a great album cover meant everything when enticing buyers. 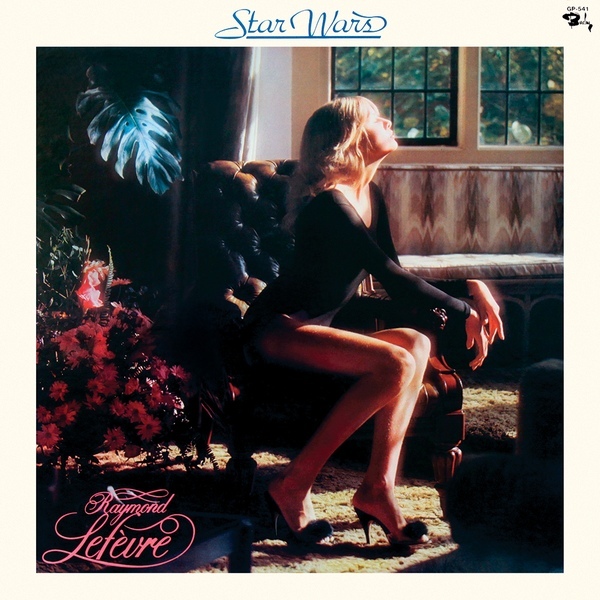 Raymond Lefèvre has released albums all over the world, most with pretty ladies on the cover. 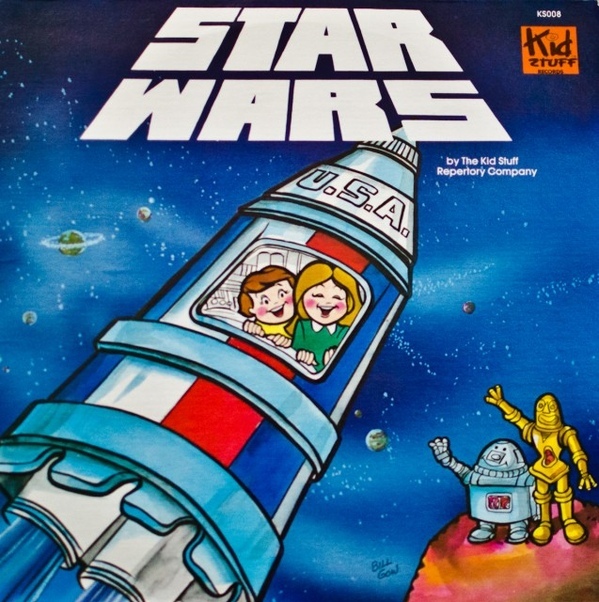 While that ploy might work on most record store goers, this 1977 Star Wars album that was released in Japan had me scratching my head. The woman is obviously not a Princess Leia look-a-like or Japanese so what's the appeal to Star Wars fans? Meco's disco masterpiece from 1977 is probably one of the most heralded Star Wars inspired albums. I enjoy Meco's Hooked On Classics albums as well so this critique has nothing to do with his actual music. 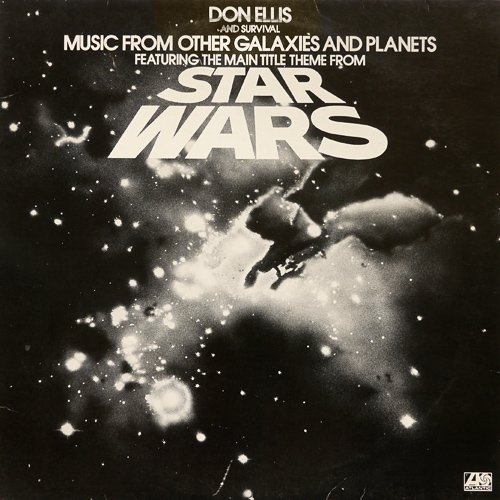 What puzzles me is why wasn't Ralph McQuarrie's work used for this album like with Christmas in the Stars? Why did we get two space people twerking instead of a glorious scene from the actual film? Kid Stuff Records did alot of good for kids in the '70s and '80s, releasing music and spoken-word albums for Masters of the Universe, Care Bears, Transformers, Knight Rider, and many more. If you scan through the images for these albums you'll see some official screenshots and fantastic original art. But for some reason, their Star Wars album isn't in the same galaxy as the others. 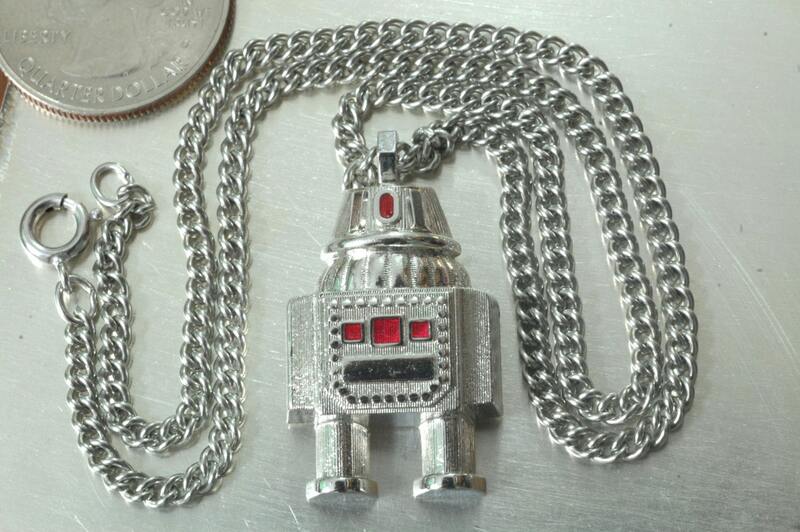 We all know who the robots are supposed to be, but R2D2 looks more like this '80s robot necklace by Avon (which I still have) than the actual droid. This guy has some nerve, right...doing the possessive name thing in front of Star Wars. The 1977 synthpop album is actually a fun listen, but what's up with the pirate skull and space balls? Did he even watch the movie? Yeah, Han Solo is referred to as a "pirate" in Empire Strikes Back but that was after this album was released. Make the skull look like Vader and the balls like Death Stars and this would've been epic! 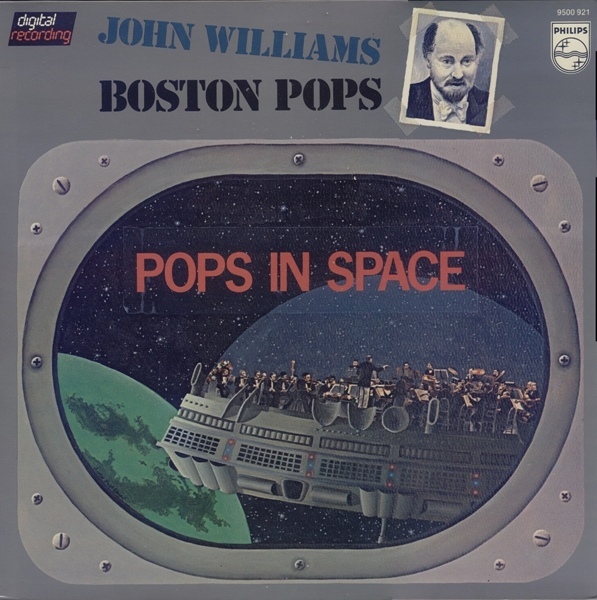 We all know that John Williams is the man, but what's up with this 1980 album cover. Am I looking through an ocean liner portal? 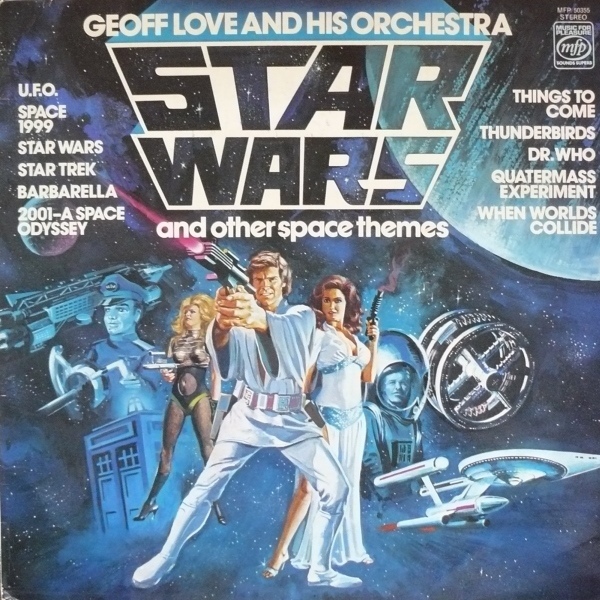 This guy composed Star Wars and Superman, so why does the poor man only get a scotch-taped mugshot on the cover? 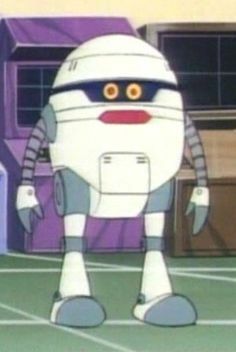 And what's up with the spaceship? Looks like a Pop-O-Matic Trouble game. I wonder if I pressed the bubble would the orchestra get all scrambled up? The people of South Korea got duped with this 1988 album. 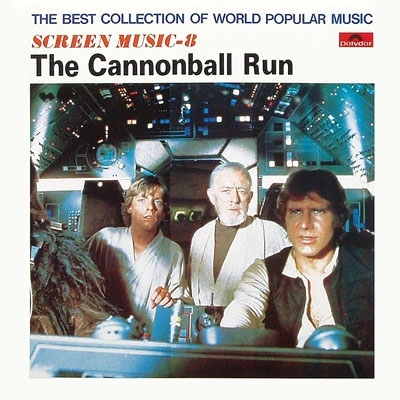 With themes from the likes of Star Wars, Jaws, and Superman II, you're gonna lead with Cannonball Run? It's like, they wanted to lead with Star Wars, but changed their minds last minute and forgot to switch the art. And poor Chewie got cropped out! It's not wise to upset a wookiee! This 1977 album actually features a pretty good rendition of the main theme, but what am I looking at, an ink blot test? it's either that or some random space image from an old textbook. This is Star Wars! If you are motivated to headline an album with the franchise, put some effort into the cover! 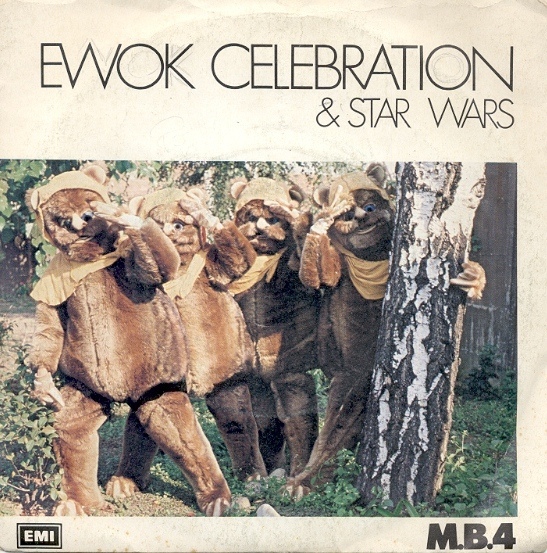 Fans might remember that Meco released an Ewok Celebration album in 1983. 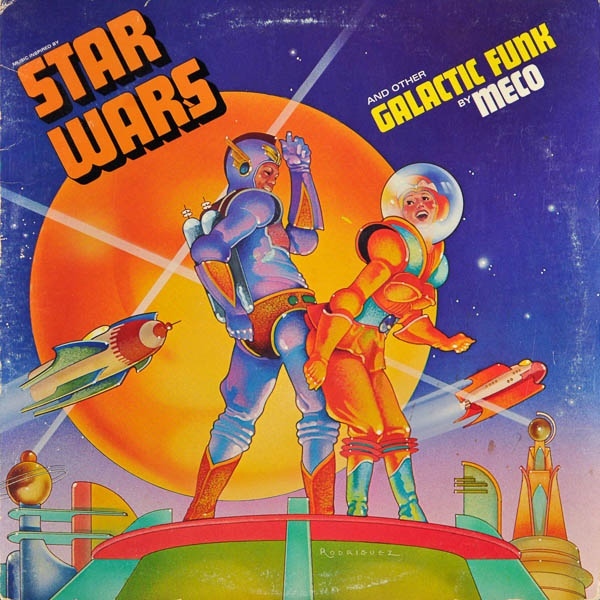 The cover was a bit dull, but the single for the title track at least featured an Ewok paw print. That same year, M.B.4 released an Italian version of the track with a new cover featuring some bad...wow, really bad Ewok costumes. 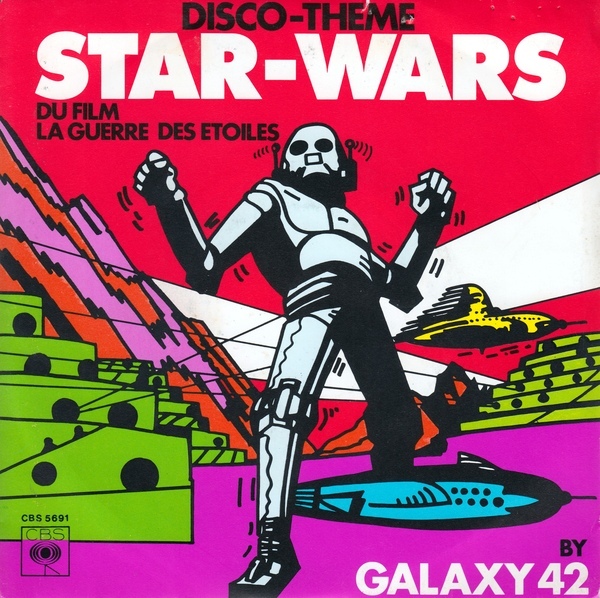 Yet another disco version of the main Star Wars theme was released by Galaxy 42 in 1977, mainly to Europe. 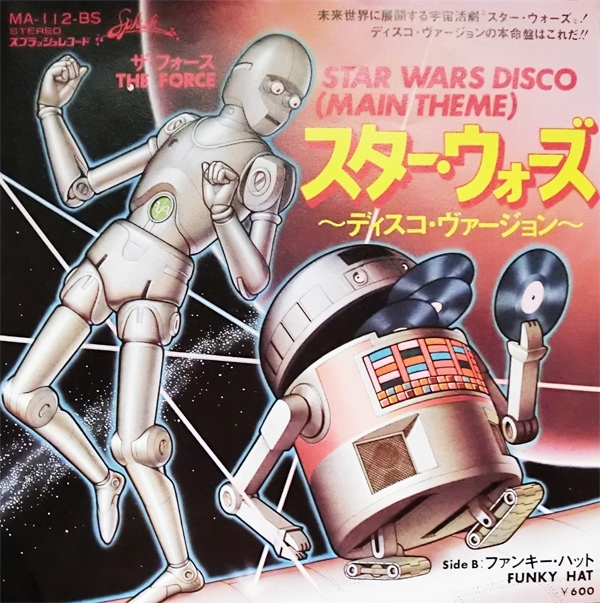 The cover of the single features a robot shaking his groove thing with lots of colorful drawings...that has nothing to do with Star Wars. Did you know that Dennis Quaid was originally cast as Luke Skywalker? Yeah, neither did I until I looked at this 1977 album cover. The artwork really isn't bad at all, but why aren't the Star Wars characters drawn more like their cinematic counterparts? When did Princess Leia ever where her hair down? Give me a little detail if you are claiming Star Wars as your own.